And fyi, there will be no more excuses. My version of C.S. Lewis’ “The Lion, the Witch and the Wardrobe” is called “The Leopard, the Hyenas, the Baboons and the Lionesses” and while this was not Narnia, I found it just as magical. We were the first vehicle out, again, at 5:40am. 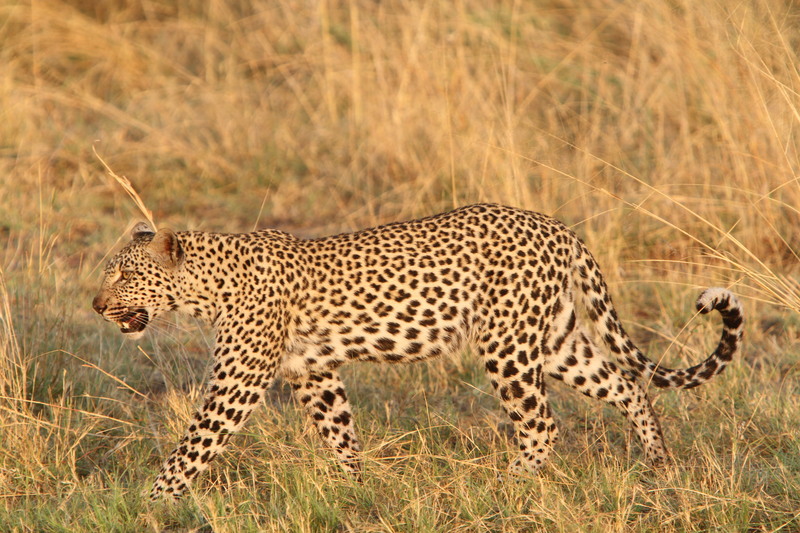 We headed right back to Leopard #3 that we had seen late yesterday. She was only five minutes from camp and we discovered that she had made yet another kill – this time a reedbok. 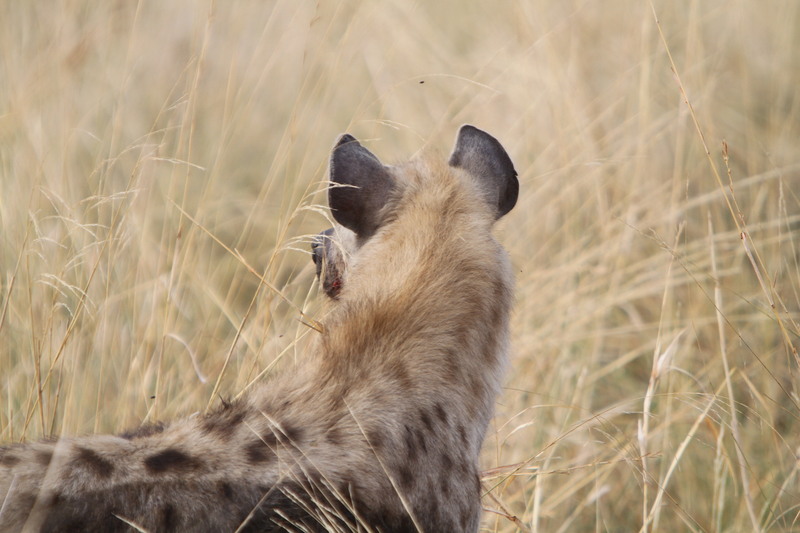 No sooner had we spent some time photographing her, we saw two hyenas racing in our direction (really in the direction of the dead reedbok – they had no interest in us). The leopard took cover in a nearby tree as the hyenas feasted on her fresh kill. 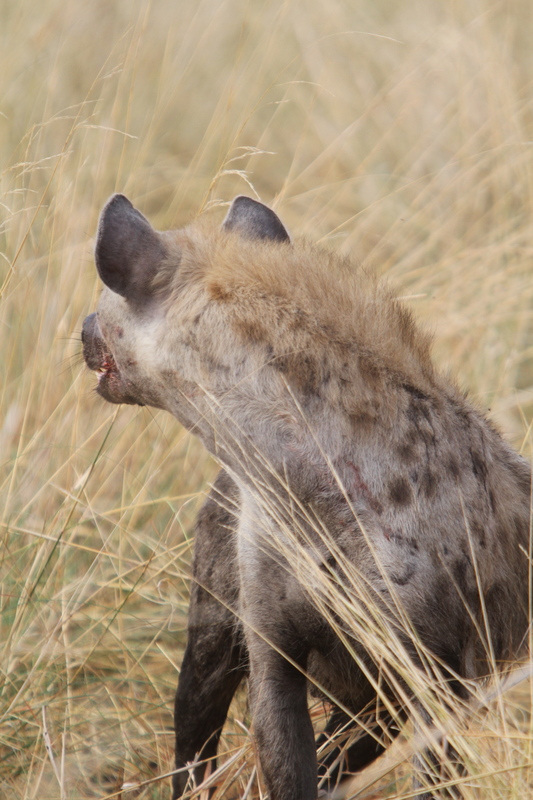 I have to admit that I am not an adoring fan of the hyena and have never found them particularly attractive, but I am quite pleased with these head-shots and think I may have captured a bit of their wild beauty. We spent a bit of time with the hyenas as they devoured the reedbok and then turned our attention once again on the leopard in the dead tree. In the midst of watching her we were surprised by her sudden decision to leave the tree and dive for deep cover. We were a bit disappointed that she was now out of camera range but Isaac told us to keep our eyes open, as she must have seen something that scared her enough to move from the safety of her tree. Remember, she was in a dead tree, so anyone or anything could easily see her from a distance. From our vantage point, this still didn’t make a lot of sense – the leopard is the only big cat who climbs, and leopards usually find safety in trees… but then we heard the baboons! There was a troop of 30-40 baboons heading in our general direction making a lot of noise (and fyi, baboons and leopards are deadly enemies – I have heard guides talk about adult male baboons and adult male leopards each fighting to the death). The baboons settled on another “island” of trees a safe distance from the leopard. 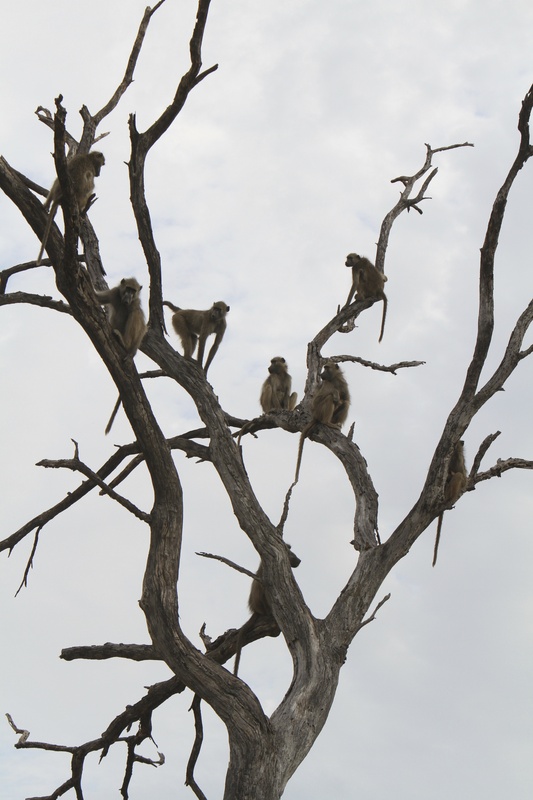 Then the baboons started screaming – again, we had no idea the reason, but from their elevated position in the trees they had a much better vantage point to take in the overall surroundings. Isaac quickly drove us to the troop and said again, keep your eyes open, they are sounding the predator alarm. I should clarify that while I said the lioness was being “gentle”, she was being as gentle as a 350 pound cat can be with a 3 or 4 pound baby baboon. The baby was showing signs of physical harm and fatigue from the whole ordeal. After allowing the baby to “suckle” for a bit, the lioness again picked the baby up in her mouth – I was in agony watching the baby’s ordeal – and kept on turning off the video option on my camera because I it was hard to record. Saved by the bell (of sorts)… just at that moment when we thought the baby’s odds were dwindling, the lioness was distracted – this time by two male lions. Enter stage right the two brothers we had photographed the previous morning. We initially thought (as did the lionesses) that the boys were interested in the dead baboon (which no one had paid much attention to since its killing). The big boys made a half-hearted attempt to check out the dead baboon, but we ultimately figured out that they were much more interested in “checking-out” the ladies themselves. 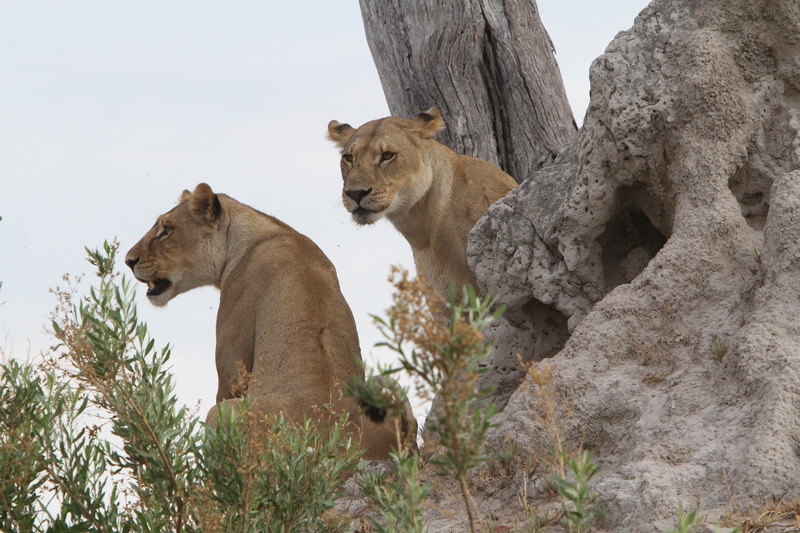 Evan caught a couple of great shots where the lionesses made it very clear how they felt about the boys – NOT. Back to the baby baboon – with the lionesses busy trying to ward off the amorous advances of the brothers, the Big Male Baboon, which had been trying to no avail to rescue the baby all the while, was now able to climb down the tree, grab the baby and then head back up for safety. Unfortunately, he chose a dead tree, so while that was good for our photography, he soon felt the heat of the sun. 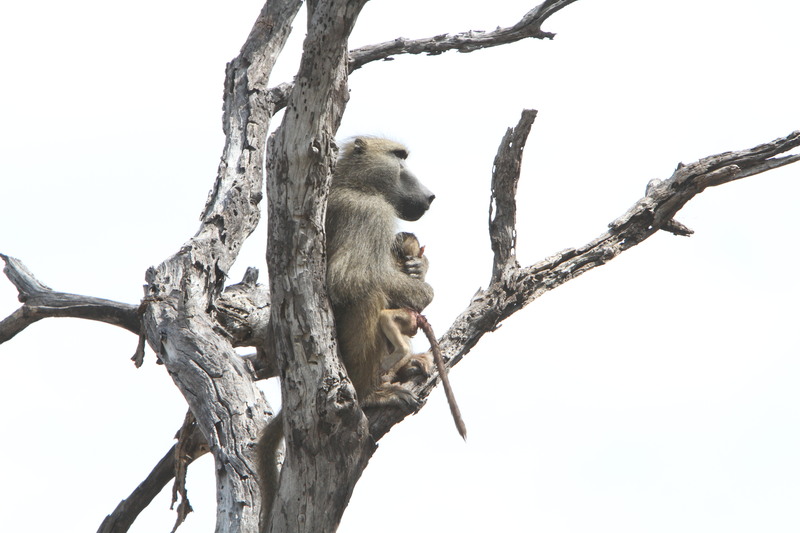 I was touched by how gently the Father Baboon held this little baby who was in tough shape after its ordeal. The baby’s body appeared limp and we thought it had succumbed. Isaac told us that if that was the case, the Father would most likely still hold the baby for a few days before finally letting go. After watching these human-like emotions and actions, it’s pretty hard to doubt Mr. Darwin and his theories. With the heat of the morning sun getting stronger by the minute, the Father Baboon had to make a move. Holding the baby, in all sorts of contorted positions, he tried numerous times to climb down the tree. He tested the lionesses’ interest with each descent. Finally, the combination of daring courage and the lionesses own desire to take cover in some shade allowed him to find safety and a little peace in the shade of a neighboring tree. And what happened to the baby? I like to think that the little guy survived with the help of his troop. He was alive and safe in his father’s arms when we left and that’s how I like to remember it. No matter what, he remains an inspiration to me – and a reminder, that life is fragile and no matter how much I fight to control its outcome, I am at the mercy of the universe. All we can do is live in the moment. And all of this happened in two and a half hours…. 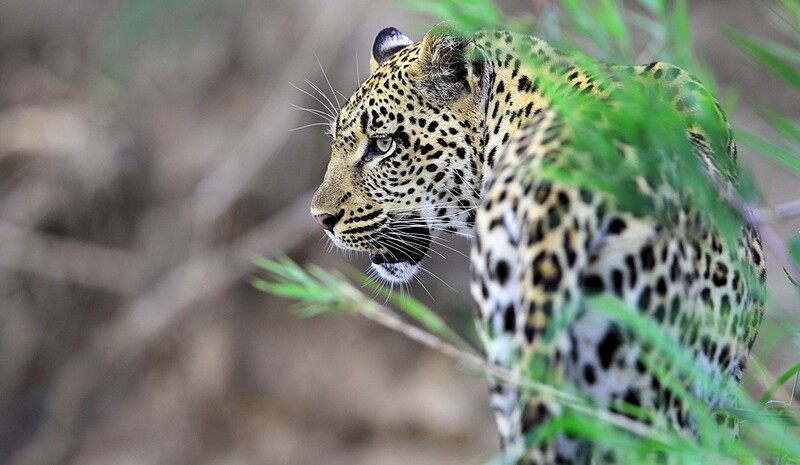 This entry was posted in Africa, African Big Cats, Botswana, Selinda Camp, Wildlife and tagged Baboons, Botswana, CS Lewis, Evan Schiller, Great Plains Conservation, Hyenas, Isaac Seredile, Leopard, Lions, Selinda Camp on January 23, 2013 by laholzwarth. Wow – what an amazing moment to witness! I would have been afraid to keep watching… How lucky that you stayed through the happy ending! Fantastic blog! The pictures are just incredible. What a journey! If you are not already following Lisa’a blog and would like to, click on the link to send you directly to her page to follow. Reblogged this on Great Cats of the "World". Thanks for the reblog. Glad to find another Big Cat supporter – they need all the help they can get and they need it now. Thanks again for your efforts. You are most welcome. Really, what a day it was. Still brings back goosebumps thinking about it. Our guide said that in the 18 years of guiding HE had never experienced a morning like that. We were incredibly fortunate. Your photo series along with your narrative made for a very exciting and interesting read! Well done. Thanks very much. I am fortunate that my husband, a professional photographer, is there getting the best shots, but occasionally I catch one too. I love the writing and Big Cats are our passion. We need to start getting the world to understand that how endangered so many of these species are and that without conscious change, we will lose them. I have just found your blog and I love how you weave your experiences with the photos. But this story of the lioness and the baby baboon is so powerful. Thank you. Thanks Judith. That day was absolutely incredible. Our guide, Isaac Seredile, who has over 18 years experience in the bush said he had never witnessed anything like this. Truly extraordinary and we feel very fortunate to have been there. Evan and I have been thrilled that so many news agencies have picked up on this story and that it has had such extraordinary circulation around the world. Unfortunately, a number of agencies have put their own “spin” on the story based on the pictures. If you go back and read my blog post which was written in January 2012 you will get the most accurate account of what occurred on that incredible morning. Bottom-line, we do not believe that the lioness was in any way “protecting” the baby baboon, but she was definitely intrigued by the little creature. While she could have chosen to kill it instantly, she did not. The baby baboon was still pretty banged up and traumatized in the ordeal. Ultimately the arrival of some male lions distracted the lioness, providing a brief window for the baboon lead male to rescue the baby. Thanks again for your interest. Wow..what an amazing story and well narrated. Thank you so much. Thank you. It was an incredible experience. Our guide said in his 20 years in the bush he had never witnessed such an interaction between species. I did watch the 2006 documentary, Eye of the Leopard”, where Derek and Beverly Joubert caught on film how a young leopard cared for a baby baboon in a tree (after it had killed the mother). The baby ultimately died of exposure during the night. It appears that the lioness was doing what cats do – playing with its prey before killing it. You mention that she picked up the baby in her mouth after lying with it between her paws and at that point you couldn’t bear to keep videotaping (so apparently she wasn’t being gentle at all and was injuring it? )… and it appeared to be badly injured and limp and not moving in its father’s arms after the father baboon grabbed it. And yet end on a perhaps overly cheery note, that you like to think it survived. Realistically, wasn’t it already dead when you took the last photos? Sorry for the delay on this. The baby baboon was not dead when we left it. It was definitely weak, exhausted and traumatized by the ordeal. We went back that afternoon and the following day but did not find the baboon troop. At that young age, it’s survival was definitely in question, but as I wrote, I chose to believe it would live. The father was incredibly courageous in his rescue. Our guide said that no matter what happened, dead or alive, the father would probably hold onto the baby for a number of days. I have just been inspired thrilled amazed by the hearwarming photos and the lovely narrative. Thank you so much for sharing it with us all. I hope that it serves to remind us warring humans that other living creatures are so much more deserving of our respect and protection . Hopefully we will learn to cherish the amazing world we live in. Thanks Grishma, I’m glad this piece moved you. It really was an experience of a life time and it does make me appreciate each day.